Philly Against War is a network of activists and organizations dedicated to ending the US wars and Occupations. We also support the right of the Palestinian people to self-determination. We get no corporate funds or foundation grants. We operate on the donations of folks like yourself. Your donation is not tax deductible. Our Nakba-Third Friday protest for May 2011. Our Third Friday protest notification for August '10. To be repeated every third Friday. Pictures on Facebook of February 2011 protest. 3rd Friday flyer. Synopsis of Israel-Palestine border. ANSWER protests continued war in Iraq. John's photos. John's view. Philly Don't Orchestrate Apartheid will protest between 6:30pm to 8:30pm as their regular weekly demonstration time. Days of the protest will be announced every week, either through the C-J Allies mailing list or the the Facebook page Philly Donâ€™t Orchestrate Apartheid. The Kimmel Center is at South Broad and Spruce Streets, a few blocks South of Philadelphia's City Hall. 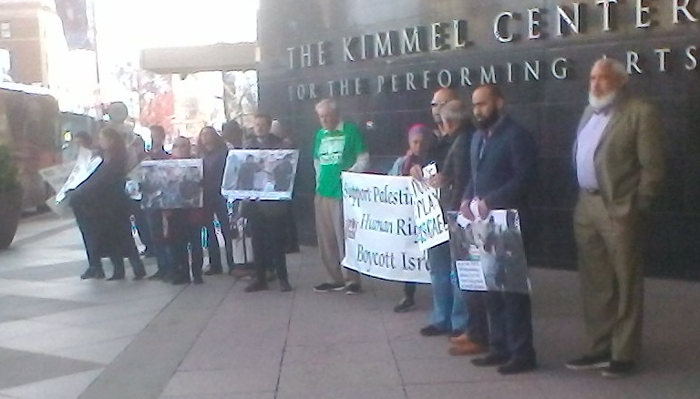 Philly Don't Orchestrate Apartheid has a petition to encourage the Philadelphia Orchestra to not play in Israel. The SF Bay Area Mobilization Against the U.S. Wars at Home and Abroad put out a call to action for a march on February 12th. Local antiwar groups in Philadelphia are thinking of a march of their own in mid-April. Why? The Progressive is documenting that US troops appear to be permanently occupying Northern Syria. ISIS has been defeated, so there's no reason to be there except to try and take Syria away from President Bashar al-Assad, who is backed by Russia and Iran. The US had an informal mandate from the people of the US to battle ISIS (Congress never formally declared war) , but there's no mandate to fight a proxy war against Russia or Iran. Israel and Palestine - who is the problem? More than 10 times as many Palestinian children as Israeli children have been killed since 2000. More than 4 times as many Palestinian civilians as Israeli civilians have been killed since 2000.
and then Prime Minister of Israel Ehud Olmert admitted they continue to fund Hamas. The antiwar movement is back in the streets. Thousands marches in New York on April 9 and April 10 in San Francisco. These demonstrations represented an important step forward for UNAC and the antiwar movement as a whole. The antiwar movement has been in a lull since before the election of Barak Obama as many hoped the change in administration would mean an end to the wars. We are now in a rebuilding phase and UNAC has made it clear that the rebuilding of a new antiwar movement is our goal. The new antiwar movement needs to oppose the US foreign wars but also defend the domestic victims of the “war on terror,” the Muslims who are being attacked. It must connect to dots between the money spent on war and the attacks on unions and cuts to education and needed programs. It must also stand for justice for Palestine. This is what these demonstration on April 9 and 10 did. More - including many links to videos and photographs of April 9 & 10 demos Also, Muslim Peace Coalition. Letter of Unity (PDF) - to add your individual name and/or the name of your group as endorsers, contact John Kirkland.